Univ Of Minnesota Press, 9780816679577, 276pp. The vivid, dramatic images of distant stars and galaxies taken by the Hubble Space Telescope have come to define how we visualize the cosmos. In their immediacy and vibrancy, photographs from the Hubble show what future generations of space travelers might see should they venture beyond our solar system. But their brilliant hues and precise details are not simply products of the telescope’s unprecedented orbital location and technologically advanced optical system. Rather, they result from a series of deliberate decisions made by the astronomers who convert raw data from the Hubble into spectacular pictures by assigning colors, adjusting contrast, and actively composing the images, balancing the desire for an aesthetically pleasing representation with the need for a scientifically valid one. In Picturing the Cosmos, Elizabeth A. Kessler examines the Hubble’s deep space images, highlighting the remarkable resemblance they bear to nineteenth-century paintings and photographs of the American West and their invocation of the visual language of the sublime. Drawing on art history and the history of science, as well as interviews with astronomers who work on the Hubble Heritage Project, Kessler traces the ways that the sublime, with its inherent tension between reason and imagination, not only forms the appearance of the images, but also operates on other levels. The sublime informs the dual expression—numeric and pictorial—of digital data and underpins the relevance of the frontier for a new era of exploration performed by our instruments rather than our bodies. 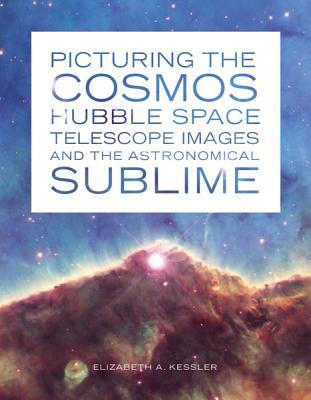 Through their engagement with the sublime the Hubble images are a complex act of translation that encourages an experience of the universe as simultaneously beyond humanity’s grasp and within the reach of our knowledge. Strikingly illustrated with full-color images, this book reveals the scientific, aesthetic, and cultural significance of the Hubble pictures, offering a nuanced understanding of how they shape our ideas—and dreams—about the cosmos and our places within it. Elizabeth A. Kessler teaches art history at Stanford University.